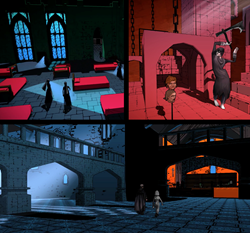 City Quests Media (UK) releases MISSION 1545, Adventure Through the Shadows of Tudor London. Mission 1545 is set in a stormy underworld where players lead Willa running the city ramparts in a night-long mission to save an outspoken monk imprisoned at the Tower of London. They navigate an M. C. Escher comic book world with themed gate-towers along the way. City Quests Media aims to immerse players in history through rich 3D soundscapes, stories and therapeutic non-combat play. The soundtrack is a smoky mix of medieval electronica and driving percussion, choirs and bass composed by Heaven 17 front man, producer/composer, Martyn Ware. Surrealist-fantasy illustrator, Finlay Cowan worked with Natasha Seery re-imagining the city gates and cast of characters for London’s favourite writer-historian David Long to script. Isabelle Allen (Poster Girl 'Cosette' from Les Miserables) voices Willa, and vocal chameleon Enn Reitel (Spitting Image, Tintin, Monty Python) plays most of the men. Seven gate-towers to conquer along the London Wall before players reach the Tower of London complex, beginning with Ludgate Priory (Blackfriars) chased down by Newgate, where the self-loathing cockney Jailer, Albone rules the roost. Get out of there free and players reach Aldersgate Theatre next, a world of exotic props and toys. Moving from comedy to tragedy, Cripplegate Hospital (based on St Barts) is next and mercy killing is recommended. Survivors of 16th century healthcare will be welcomed into Moorgate's bosom after that with a bonus excursion to Bedlam on offer. Brewers are the rockstars of Aldgate with business booming. The sweet water they use has leached through three graveyards upstream. True. Their attic is an enchanted Hop Forest (not so true) and last stop before the Tower of London. In keeping with the general mash-up of fact and fiction this is home to Henry VIII, a couple of late wives, Beefeaters and the Executioner. Gallows humour abounds as players navigate this last labyrinthe passing through the Royal Mint, Armoury and Crown Jewels in the final hunt for the cell where Brother Joseph is held. Light cones indicate enemy sight and players falling into them are returned to the last checkpoint. Mission 1545 is an isometric world of colour and architecture designed to emphasise the contrast between light and shade with puzzle-style sequences in places to unlock the way ahead. With on/off hints, God views, level skipping and immersive soundscapes City Quest Media hopes Mission 1545 might attract new audiences to gaming. Soundtrack by multi award-winning composer fusing voice, choir and instrumental music. Fully animated and voiced story-telling. Subtitles: Chinese (Simplified), French, German, Japanese, Korean, Russian, Spanish. Mission 1545 is available for Windows and MacOS from Steam for just $4.99.